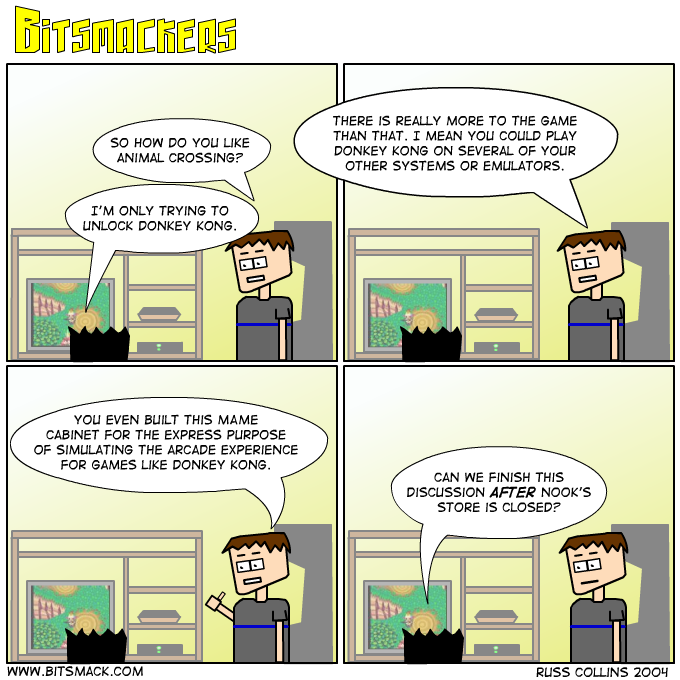 <a href=http://www.bitsmack.com/modules.php?op=modload&name=Comics&file=index&action=comic&id=420>Today’s comic</a> will cost you 1000 bells. I have to pay off Nook or his goons will break my legs. What… he doesn’t have goons? Then why am I paying him? A comic about Animal Crossing? What is this 2003? Well Brad picked up the game over the weekend and I finally got a chance to play it. The game is kind of like having a job. You do it every day and eventually you get to play NES games. This is too close to my real life. So far I have unlocked Tennis, which is a lame game, but the fact that you earned it makes it a little more enjoyable. The non NES portion of the game is fun. I look forward to the new stuff I get to do each day. Zelda, the Four Swords comes out on Tuesday. I actually preordered this one for a few reasons. I played it on the GBA against Goz and it was fun. Most of my friends still have their GBAs and link cables left over from Final Fantasy Crystal Chronicles. I got a free t-shirt for preordering.